Although the relationship between Australia-Indonesia government is quite close, it still needs to be supported by relationship between citizens of the two countries or people to people contact. Strengthening people to people relationship might bring positive impacts in various aspects. One of the efforts is through bridging the cultural differences between the two nations in order to bring the two citizens closer. As said by Director of Directorate of Marketing, Cooperation and Alumni (DPKA) UII, Hangga Fathana, S.IP., B.Int.St., MA at an event “Cross Culture Discussion and Cooking Class: Indonesia-Australia Bound in Harmony”. 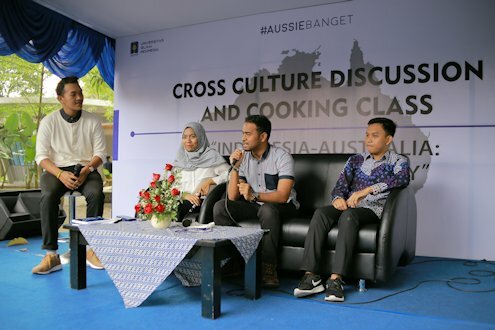 The event was held by AussieBanget Corner (ABC) UII and consisted of several agenda including Discussion Session, Cooking Demonstration of Indonesian and Australian Cuisine, as well as Music Performance. The event which attracted many visitors was held at the Parking Lot of Unishop UII on Saturday (28/04). Attending the event were representatives from the Australian Embassy in Jakarta, Australian students in Yogyakarta under the auspices of the Australian Consortium for In-Country Indonesian Studies (ACICIS), and the Australia-Indonesia Youth Association (AIYA). 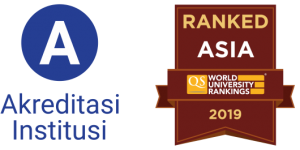 “UII as an educational institution is fully aware to engage in strengthening relations between Indonesia and Australia. We want to broaden the awareness of Indonesian society, especially the academic community to make connection with Australians in Indonesia “, he said. He wants the ABC UII not only to symbolize Australian diplomacy at UII but also the symbol of UII academic community who wants to further learn about Australia. The discussion session was managed by UII students who had visited Australia, such as Bintar Mupiza (International Relations), Zulhazmi Luthfi (Environmental Engineering), and Egista Pregi (English Education). Bintar said Australians are very friendly especially when in the mosque. “They really appreciate me when I spoke to them even though they are older. For those of you who want to go to Australia at least try to contact the PPI or UII Alumni to know the situation there. “He said. Egis added that the living cost in Australia is quite expensive, due to currency differences. In addition, some people there still not comfortable with foreigners who wear the hijab, but it depends on the personality of each person.